do you use bang with friends–the anonymous, simple, fun way to find friends who are down for the night? well, if you do, maybe i know about it. or maybe i don’t. 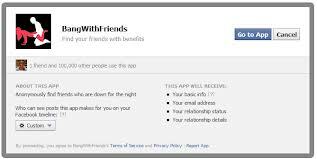 bang with friends is an app that sorts through your facebook friends list, looking for friends who are interested in a casual hook up. if both of you are both interested, bang with friends will put you in touch. where and how you bang is up to you. it’s not the sort of app you want your parents or your coworkers to know you’re using. ditto that ex-boyfriend whom you keep on your friends list because you want to check out his new squeezes–knowing you’re using the app would make you seem so . . . desperate. bang with friends has been slammed by the clueless media outlets like huffington for letting everybody know just how desperate you are. worst nightmare, right? especially if it turned out you AND your parents were using it. but media reports are quite wrong, with a caveat. bang with friends automatically adjusts its privacy setting. right now it’s set at “only me” being allowed to see that you’ve installed the app. on the other hand, there are people who joined bang with friends before january when facebook graph search opened up everybody’s treasure box of apps. that just means that if you installed this app before january and you don’t want anybody except that casual encounter you’re about to have to know that you’re using, you have to manually adjust your privacy setting. or you could just not use the app, book a flight to vegas and see what happens.